Okanagan Tree Fruit Cooperative packing house, Oliver, B.C. scientists is scrambling to invent the perfect apple. The paring knives cut into the flesh swiftly. Chrrrack. Crunch crunch crunch. The hallway of the open work area on the second floor of Agriculture and Agri-Food Canada’s Pacific Agri-Food Research Centre (PARC) in Summerland fills with the sound of chewing as the tasters contemplate what has just met their taste buds. “Pass or fail?” asks Cheryl Hampson, apple-breeding research scientist. Apple 8S 54 60 sits in a green plastic crate awaiting sentence. “I say unless it’s got bigger flavour, with that appearance it’s not going anywhere,” comments research technician Darrell-Lee McKenzie. She drags the crate of brown-hued apples to join the compost pile. I ask Hampson, who has dedicated 16 years of her career to breeding the perfect apple, what makes for a winner. “That’s entirely in the tongue of the beholder,” the petite middle-aged scientist answers before breaking into a trill of laughter. It’s early winter here in Summerland and a biting wind makes Lake Okanagan look more like Loch Ness. The only relic of the warm summer sun that bathes these slopes is the fruit before us. Armed with knife and spittoon, the pre-tasting panel is mercilessly thinning the pack. 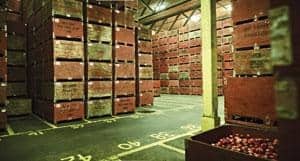 Of the 21 crates of apple varieties before us, only six will go on to blind taste tests that evaluate their skin toughness, crispiness, juiciness, sweetness, sourness and flavour intensity. To make it, a new apple has to be the best apple you’ve ever eaten. Literally. “Because we are trying to beat what’s out there, to get a new apple on the market it has to be pretty darn good,” says McKenzie. When apple researchers reel off potential apple flaws, it’s like listening to your girlfriend damn all her online dating prospects. They’re too fat. Their colouring is off. They have too many freckles. They have a calcium deficiency that leaves black splotches on their skin. And you know all bets are off when they leave a bad aftertaste in your mouth. To be fair, these horticulturalists taste apples for two to four hours a day throughout the winter months. (One retired PARC employee boasts that he has tasted over a million apples in his life.) So it’s not just that their palates are jaded. Their tooth enamel is starting to erode and their stomach acid is spiking. Outside the walls of PARC, B.C.’s apple industry is in deep crisis as its growers continue to bleed money. In the past three years, apple growers on average have failed to make their costs of production. In the past year, on average, growers pocketed 17.2 cents a pound for apples that cost them 22.5 cents a pound to grow. Small wonder that apple trees are being replaced by cherries and wine grapes. At one point, 20,000 acres of apples carpeted the Okanagan. That number’s down to 8,500 today and continues to shrink. 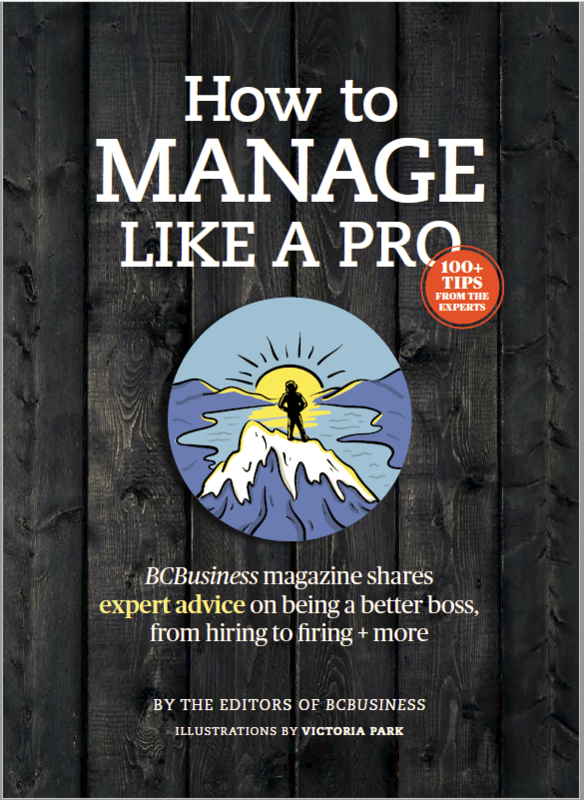 “One does not have to be an economist to realize that that situation is simply not sustainable and so we’ve got to find a way to turn this around,” says Joe Sardinha, president of the B.C. Fruit Growers’ Association. The stakes are considerable. Apples are Canada’s largest fruit crop in terms of tonnage, and its second most valuable agricultural crop. B.C. alone grows over a billion apples each year and apple growing in B.C.’s Interior contributes around $720 million to the economy annually. One school of thought is to breed our way out of the mess, since newer, better apple varieties can be more profitable. The Ambrosia apple, a flagship B.C. breed, is a price leader. This year, growers got exactly a quarter for each pound of Ambrosias grown. They pocket 36.1 cents a pound for the top earner, Pink Lady. But Macintosh, Red Delicious, Granny Smith, Spartan, Fuji and Golden Delicious, which make up 44.5 per cent of B.C.’s apple crop, lost growers money. The Spartan, PARC’s first success as the only apple breed produced from a formal scientific breeding program at the time, is yesterday’s news. Growers get a measly 12.4 cents a pound for it. Even Galas, the yellow labs of apples, cost growers a penny a pound to grow. aged for shipment to retailers. PICO, which got started in 1993 with funding from the federal government and the B.C. Tree Fruit Growers’ Association, safeguards the intellectual property rights of plant-breeders, and licenses and commercializes B.C.-developed fruit varieties. It returns a percentage of its fruit royalties to the receiver general for Canada and reinvests any other profits (if any) into the Okanagan fruit growing industry. In order for an apple to even meet the consumer, it has to be disease- and pest-resistant, and able to handle the rigours of a changing climate. It must taste fresh months after picking and go on to survive navigating the packing house. It must travel, stack and sell well. The thing is, some people believe that Hampson has already bred the holy grail of apples, the Aurora. Its pale green countenance belies a burst of juicy flesh, whose sapidity is graced with lychee and elderflower notes. It’s got enough crunch to last from the first bite to your back teeth. “The internal qualities of this apple, the taste, the pressure, the storage capability are second to none,” says Rob Smith, founder of BerryMobile Fruit Distribution Inc. in Vancouver. 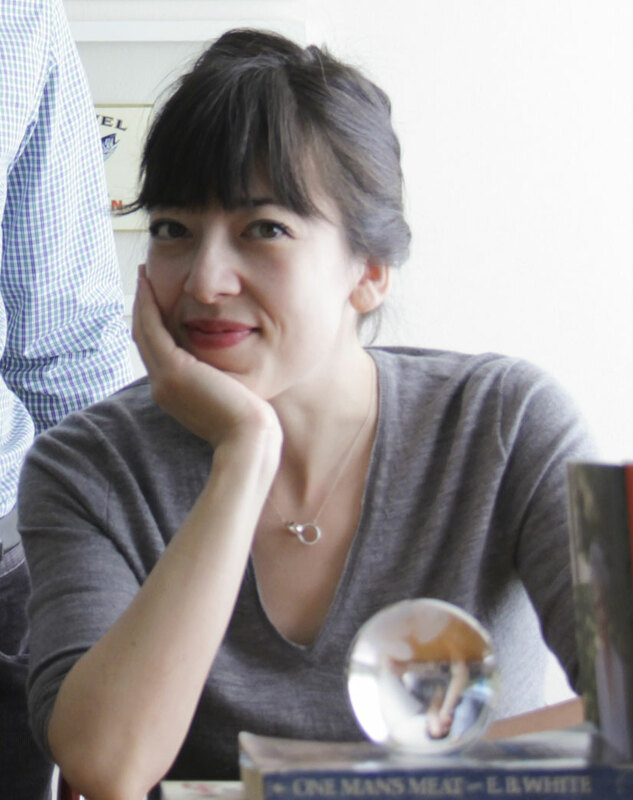 “Put against any apple in a blind taste test, it’s never been beat.” What went wrong? Well, for starters, upon meeting the Aurora, the head of PARC at the time had a better name for it: I wish I were red. In 1981, researchers at PARC crossed two red apples, Splendour and Gala. It was a good piece of matchmaking. Twenty years later, and their progeny’s stars are still rising. The Nicola, just entering the market, came out of that cross. So did its sibling, Aurora. Likewise with SPA 493, a bi-coloured apple that is being farm-tested. Cooperative packing house in Oliver. 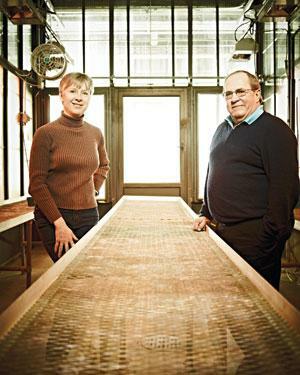 The entire process of developing a brand-new cultivar from seed to farm-testing takes about 15 years, which means that apple researchers have to read into the apple trends of 2030 today (known apple trends thus far: solid-coloured apples are out of mode; those with a red blush fare best; Eastern Canada likes its apples more tart than Western Canada). PARC’s 90 hectares of orchard are home to a rotating population of 30,000 new apple varieties (which is to say that apple varieties outnumber Summerland citizens five to one). Each year Hampson and her colleagues patrol the rows of apples, high-grading about 800 to be evaluated by the pre-tasting panel. Each row of apple siblings is a dizzying farrago of colours: red, orange, carmen, pink, maroon, purple, pale yellow, lemon yellow, rust. They come speckled, striped, solid, blotchy, freckled, squat, ribbed, heart-shaped. There are apples that taste like pink lemonade, apples that taste of dirty sock (that one in particular traumatized McKenzie; she never looks at a purplish apple with white lenticels the same since). Everything that an apple ever could be, it probably is somewhere on-site. What this looks like is a several-hundred-metre-long apple obstacle course. 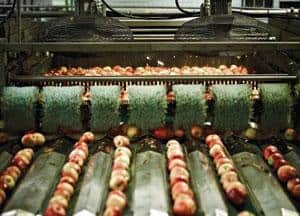 Each apple is washed, bathed, plucked, rolled, brushed, photographed 10 times digitally from all angles, herded into a flute of water, hoovered, stored, waxed and stickered. The end result is boxes of apples categorized into as many as 27 different groups of size and quality. There’s a long list of apples that never made it. From PARC alone, there’s the Spencer, Creston, Shamrock, Silken, Sumac, Sinta, Chinook – the list goes on. While the Aurora isn’t relegated to the scrap heap quite yet, the fact that it faltered so badly at the gate has been damning. And then there was the colour handicap. “It would be a world-dominating apple if it was red, but it’s yellow,” says Smith. The Aurora’s grandparent, the mushy Golden Delicious, can be thanked for that. Apples used to only come in three colors. “Green ones are sour, yellow ones are soft and red ones are sweet,” says Haddrell. But then in the ’80s things changed. 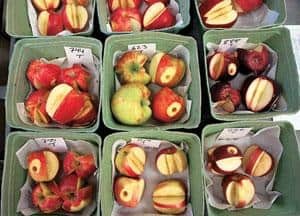 “Fuji, Gala, Braeburn – they sort of raised the eating quality bar and suddenly the old Red Delicious didn’t seem so good anymore,” says Hampson. Today yet another generation of apples has moved in, including Ambrosias, Pink Ladies and the Honeycrisp, an eastern variety developed by the Minnesota Agricultural Experiment Station’s Horticultural Research Center. Down in the turquoise Convair walk-in coolers at PARC, research scientist Peter Toivonen is running storage experiments that he believes will mark Aurora’s redemption. 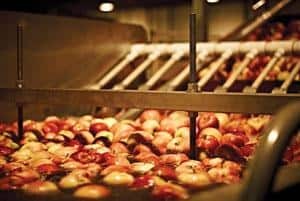 Apples are kept in controlled atmosphere chambers after they are picked, to increase their longevity. 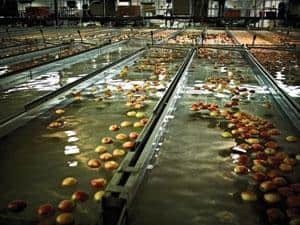 By keeping the apples cool in a chamber with low oxygen, no nitrogen, and a ripening inhibitor, the apples enter a state of suspended animation. That’s how consumers get fresh apples all year round.